Summary:In 2014 Tranen commenced rehabilitation of coastal sand dunes, where off-road vehicle activity and strong prevailing winds over five decades had progressively degraded a large area. The site was stabilised and revegetated with 50,000 dune seedlings, and is currently tracking towards the defined project targets. 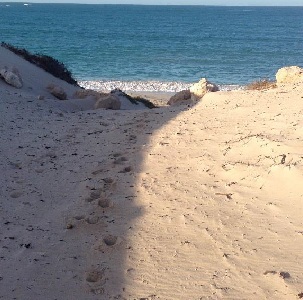 In 2014 Tranen prepared and commenced implementation of the North Alkimos (Shorehaven) Foreshore Management Plan (FMP). 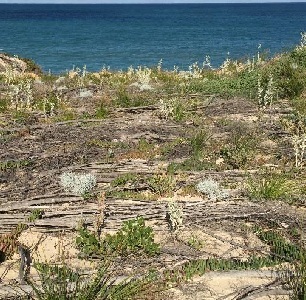 The objectives of this project are to establish 1 plant/m2 across all revegetation areas; adequately stabilise all areas within the southern dune works areas; and maintain low weed levels, so weeds are not adversely impacting on native plant survival and development rates. The site is subject to significant wind erosion, being exposed to high winds and with tall dunes. During construction, up to 10,000 m³ of sand was moving via wind transport each month. Off-road vehicle activity was high, even during construction, and had contributed to the degradation of the site. 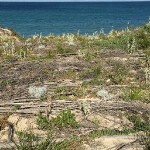 The primary goal was to stabilise the site long enough to allow native vegetation to establish and provide longer-term protection, with dunes re-profiled to create more natural shapes blending into the surroundings. Brush was placed to stabilise the foredunes and restrict pedestrian and vehicle access, and mulch was spread in the eastern-facing lee of the primary dunes. After site preparation, fences were installed to control pedestrian and vehicle access, with wind break mesh where appropriate. Prior to planting, weed control was undertaken to reduce competition with natives. However, several weed species present that were providing stability in some of the more exposed areas were left in place, to be gradually removed as the natives establish and themselves provide erosion protection. Planting was at double the ultimate target density across most of the site, triple in the more exposed sections, to establish rapid cover. This was seen as essential for long-term site protection. In 2014 49,475 seedlings were planted, and 2.655 kg of seed previously collected around the site was broadcast. A three year maintenance period commenced after planting. Monitoring is undertaken each spring and autumn to guide remedial actions. After the first summer the plant density was 1.8 plants/m2, well ahead of the target of 1.0 plants/m2. The site is stable and plant development has exceeded expectations. The average native cover after the first summer was 19%, up from 7% in the preceding spring, with the best growth observed in the brushed areas. Maintenance requirements are expected to be minimal, and it is anticipated that the project will be successfully delivered on or ahead of time and under budget.